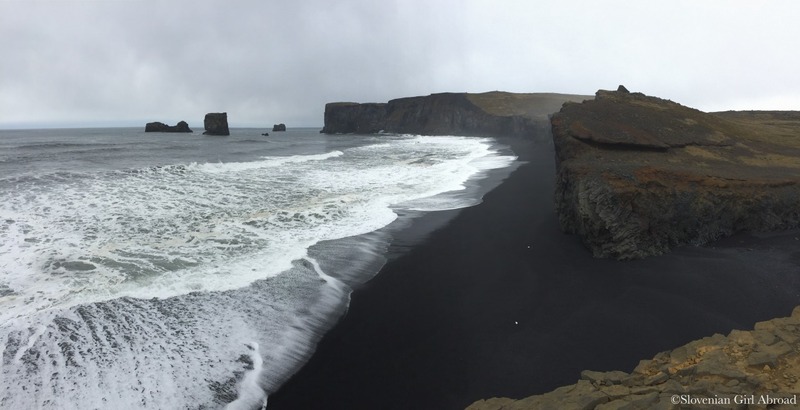 Dyrhólaey is a 120 metres high promontory located 10 km west of Vík and is of the most famous sights in Vík area. We followed the Road 281 which took us directly to the rocky plateau where we left our car and went out exploring. The views from there were breathtaking. 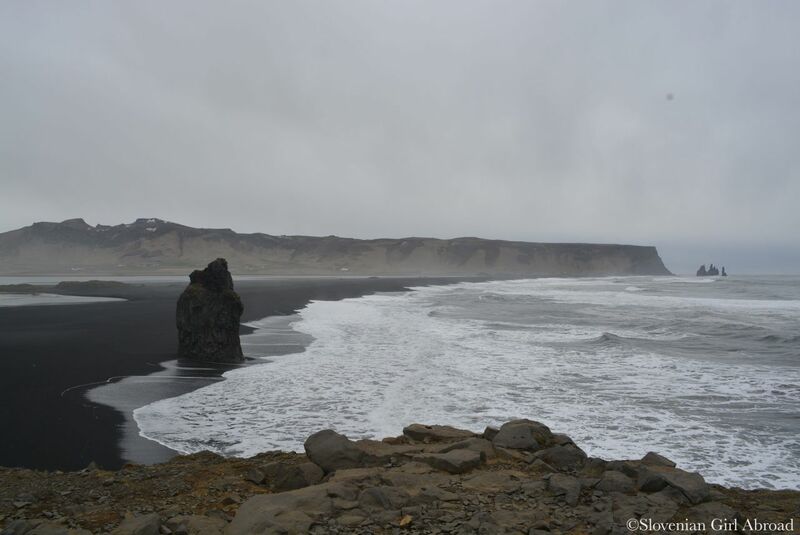 We admired impressive views to Reynisfjara beach and Reynisdrangar, we’ve already admired on our first day in Iceland. This time we saw them from different direction. We’ve also had a chance to witness the majestic power of the sea. 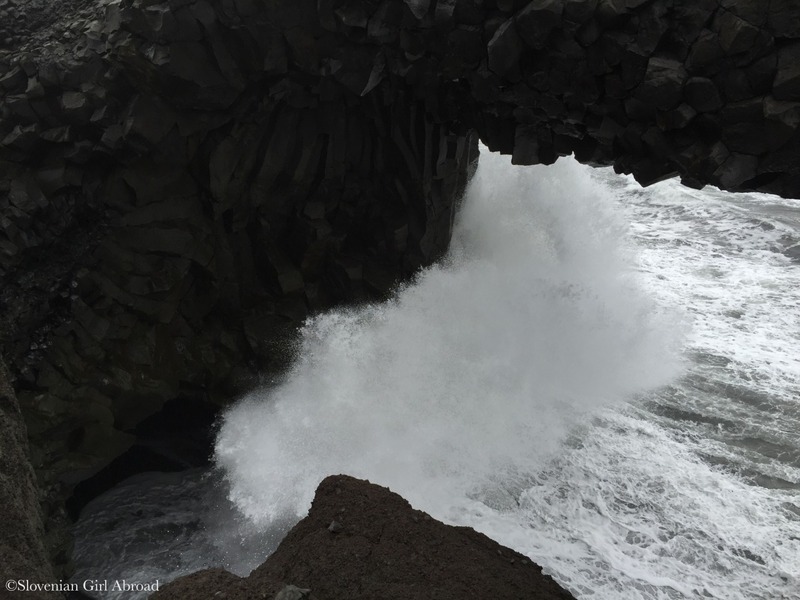 It didn’t matter whether the giant waves spread on the beach or hit the rocks, they provided us with impressive sights. After we left Dyrhólaey, we drove to nearby Sólheimajökull glacier. 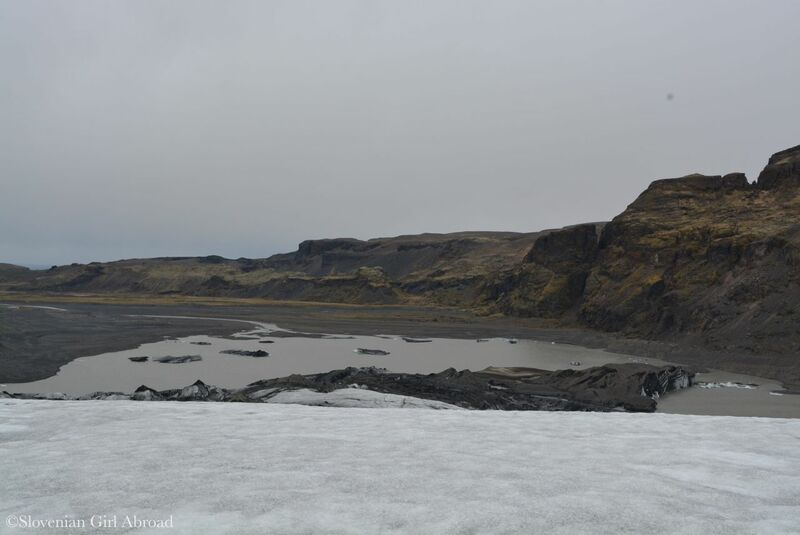 This glacier is the southernmost glacier in Iceland. Its glacial tongue is considered to be one of the easiest reachable glaciers. Getting there was super easy. From the Ring Road, we turned to newly paved road 221 which took us to the small car park and cafe. From there to the glacier it is app. 800 meters. At the cafe we spontaneously booked a glacial walk tour with Arcanum Glacier Tours and went walking on the glacier. The tour wasn’t cheap, but it was amazing experience worth every cent. Firstly, because we received the excellent lesson in geography of the region and secondly, because our tour guide took good care for our safety. 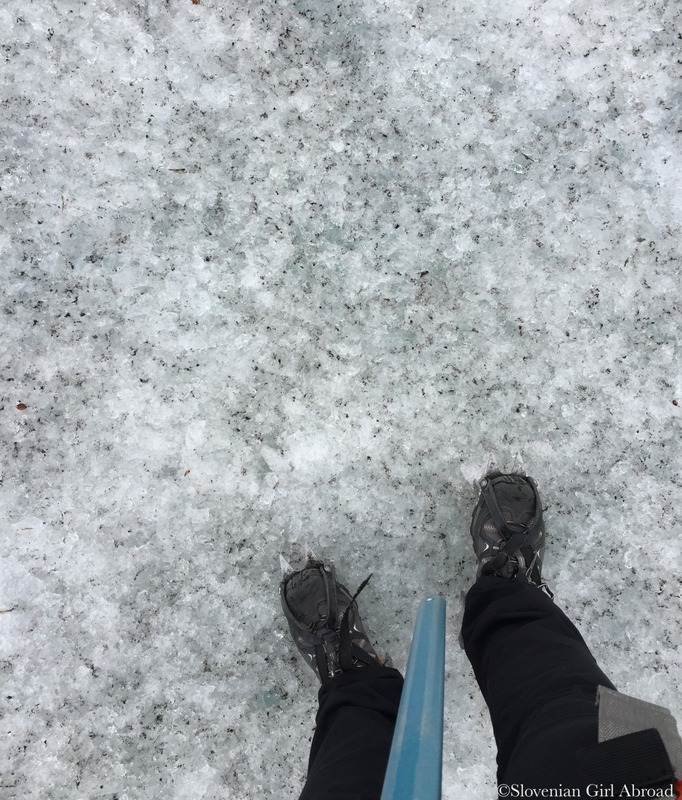 Glacier hiking can be extremely dangerous. The ice is moving, creaking and changing all the time. 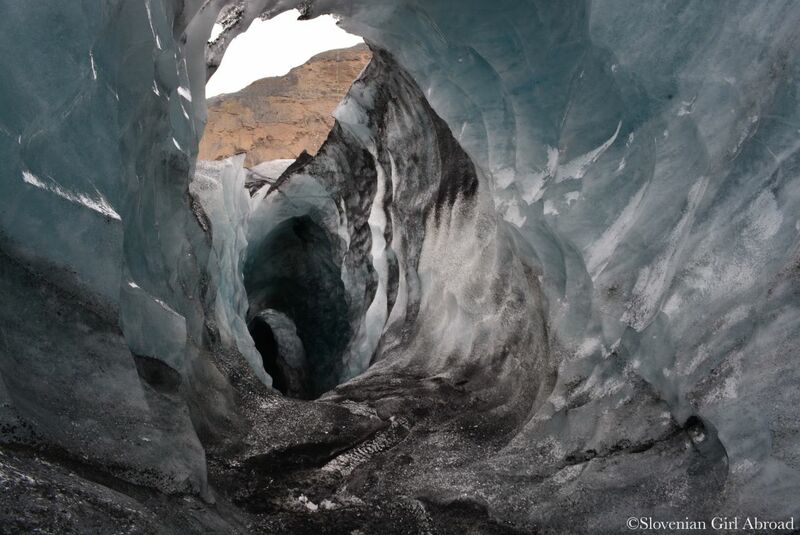 Untrained eye can easily miss the hidden traps, like sink holes, crevasses and moulins – shafts in the ice that can be hundreds of meters deep. If you step onto such area, you could fall down and break your bones, if not drown in ice-cold water. Before we went on a hike, we were provided with all the equipment needed – helmets, harnesses, ice axes and campions for our shoes. At the tip of the glacier, we not only got the safety briefing, but also the lesson on how to properly put on our crampons and some basic techniques of walking on ice. 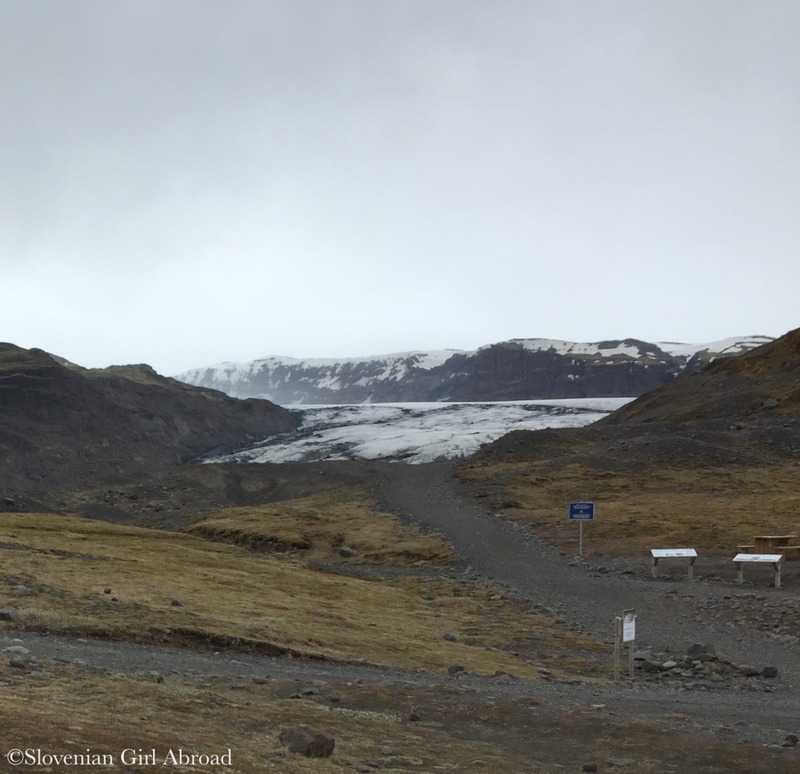 In contrast to other tour groups we’ve met at the glacier, our group was small. We were only four people in the tour – me, my husband and a really cool mother and daughter from the States. The size of a group definitely added to the cool and friendly atmosphere and the general quality of the tour. The trip up the glacier and back took about 3 hours. During the tour our tour guide Javier led us around the glacier, showed us its features and explained us all we needed to know about the glaciers, Icelandic volcanoes, geology of the area in an fun and interesting way. He was clearly passionate about his work what also added to the quality of the tour. Javier explained us Sólheimajökull glacier tongue is about 8 kilometers long and 1-2 kilometers wild and is one of the outlets of the larger Mýrdalsjökull glacier. 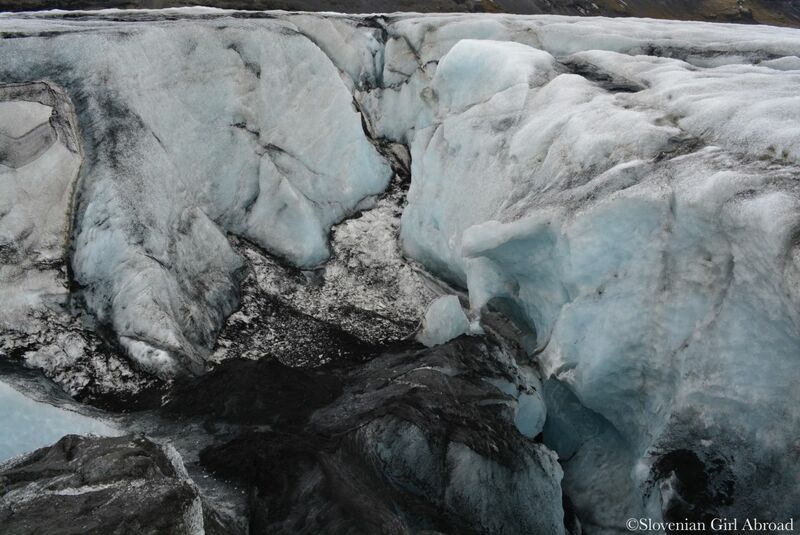 Just 20 years ago it had covered much bigger area, but nowadays is rapidly receding, like most glaciers of our world. 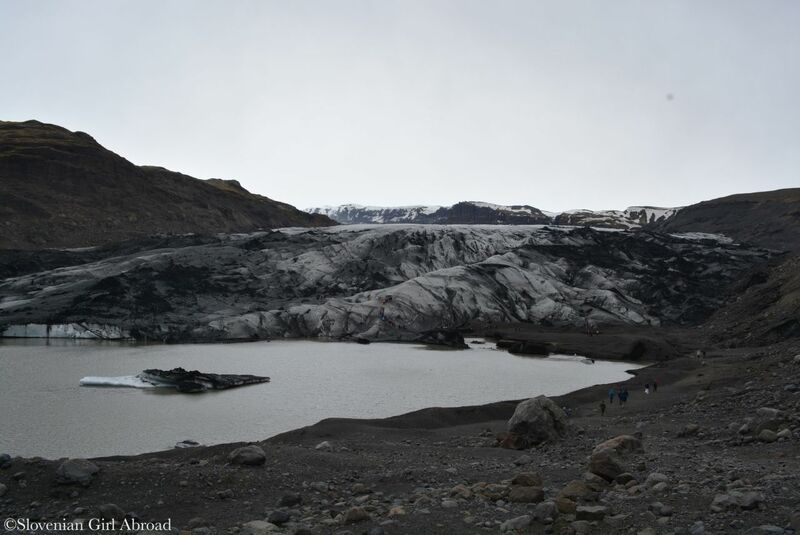 The glacier once covered the area that is now lagoon. Experiencing this unique environment was amazing. 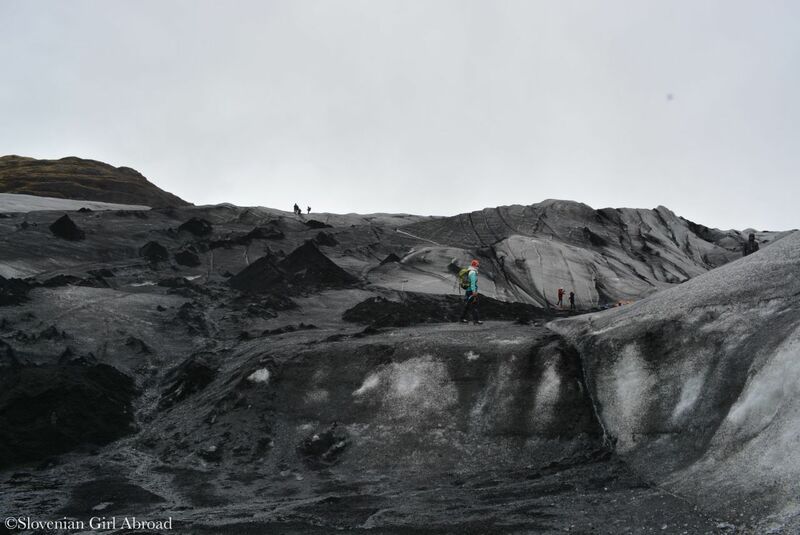 Despite the glacier looked a bit different than I imagined – it isn’t bright white, but rather grey and black from material of the past volcanic eruptions, I highly enjoyed walking on this amazing terrain. After we completed our walk on the glacier, and say goodbye to our group, it was time to hit the road again. We drove back to the capital of Iceland Reykjavik where we’ve stayed for next two nights. After we’ve checked in at our guesthouse, we went out for a dinner and a walk around the town. 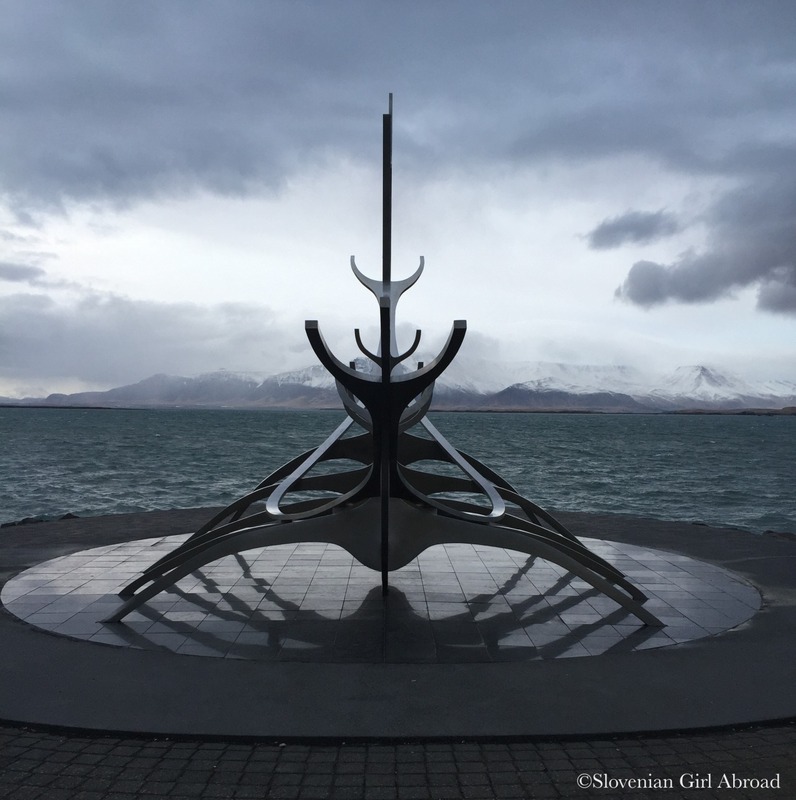 When strolled around, we’d passed some of the Reykjavik’s main sights, including Sun Voyager statue and Hallgrimskirkja church. 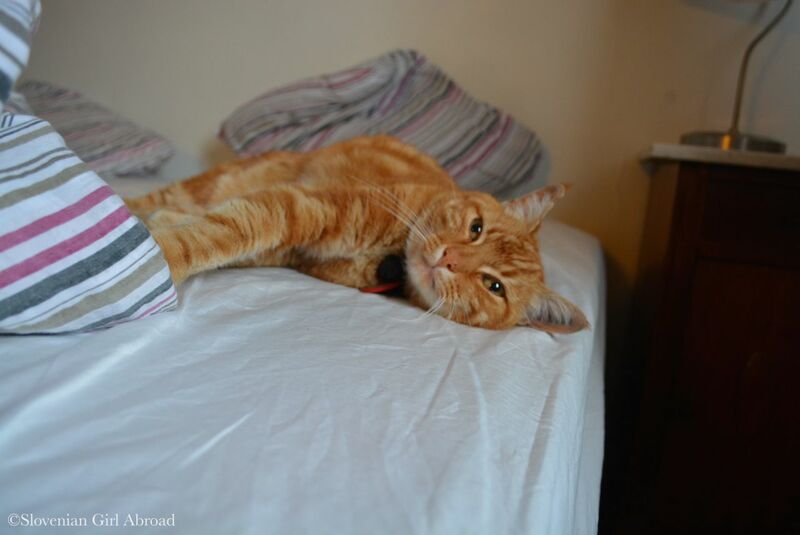 After a walk, we’d returned back to our guesthouse where the house cat Raggi kept us company until we went to bed. Can’t wait to be here next year! Gorgeous photos! Just too beautiful for words! So much adventure in Iceland! I am remembering my son’s and my trip there two summers ago – it was a blast! How amazing to walk on the glacier! So great when you land in a tour group that is small. ‘Looks fantastic and wasn’t it cool that your group was small and intimate. I can’t wait to see Iceland for myself lol! Glacier tunnel is amazing. What an incredible place. the ice tunnel looks brilliant!